I know, I know. I start a knitalong and then take on a test knit in between but that’s also the reason why I don’t have a deadline on the knitalong – we all get distracted! 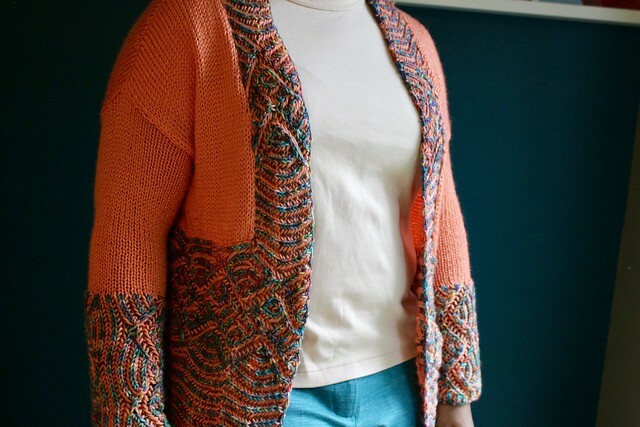 And this time I was distracted by a really good project, the La Briohème cardigan by Knit Graffiti (my Ravelry project page). Let’s consider this my virtual Rhinebeck sweater because if I was going this weekend (I am not) I would totally be wearing this. 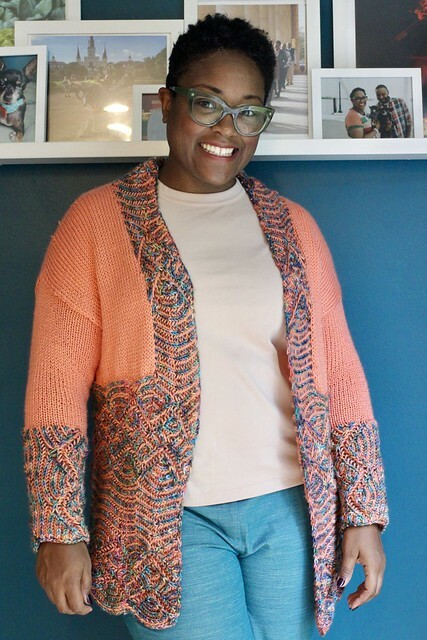 I jumped on the chance to test knit this one for a couple of reasons – I love brioche and have wanted a brioche cardigan that wasn’t completely brioche and overwhelmingly hot, I like Knit Graffiti’s patterns so I was happy to test knit AND I had the yarn I needed in my stash. It was a perfect storm. Since brioche knitting is double sided it creates a super warm fabric. To have a full brioche sweater would be a bit suffocatingly warm, I think, but this is a perfect balance. The closest I could get to you seeing the true vividness of this color was to try and photograph this in the shade. I used Knit Picks Mighty Stitch worsted in the color Conch (a really vivid coral – and all Mighty Stitch is on sale for the month of October) and Madelinetosh Tosh Vintage in Clue Board from 1985, a wonderful mix of blues, greens, corals and pinks. I pulled this color combo together by chance. I was putting yarn combos together with the quantities I needed and seeing what worked. I loved the brightness and I love blues and peaches together so I went with it. It’s got orange, blue, green, pink…all the colors I like to wear. And the Mighty Stitch yarn is so soft and cozy ya’ll. Added bonus, I blocked this by putting it in the washing machine on gentle cycle with cold water and it held up beautifully. I know some people absolutely hate yarns with acrylic in them like Mighty Stitch but it’s affordable and perfect for my climate. In short, knit with what you love and forget what anyone else says. Okay, back to the sweater. I will admit, it isn’t a perfectly executed knit on my part. I made a couple of mistakes with my brioche but honestly that was my fault for working when I was getting sleepy, or drinking a little wine, or because a dog stepped on my stitches and that created a bit of a mess. But with brioche I feel like it hides those tiny mistakes and still looks pretty awesome. Also, how else would you know it was hand knit if it didn’t have a mistake or two? It’s still good enough for me to wear and wear it I will! And if you’re curious here is the entire look, pretty typical layers for this time of year. And of course I pair a bright sweater with bright pants and metallic shoes (they’re Bryr clogs, Sophie with the kilt in rose gold). But I can also throw this on with jeans or a skirt too. It’ll be a fun pop in my wardrobe. So anyone else interested in giving this knit a try? I can already see myself making a darker version in grey with neon brioche! This is crazy beautiful. The pattern concept is wonderful and your yarn choices really display it well. I love how the heavier bottom keeps the shape and promotes drape. I hate it when cardigans bunch up over my ample behind. Wow what an awesome work of art!! Great colors together:) I love your comment about mistakes “how else would you know it’s hand made.” And of course only the maker notices those mistakes in their work😉 Would love to see one done in grey with bright brioche! Wow. I’m just beginning to play with brioche (on a hat) but that sweater is an amazing example of how beautiful it is! You are TOO much! This is fabulous. You know how to use color, wow! And I can’t believe you didn’t comment on those shoes! GET OUT! 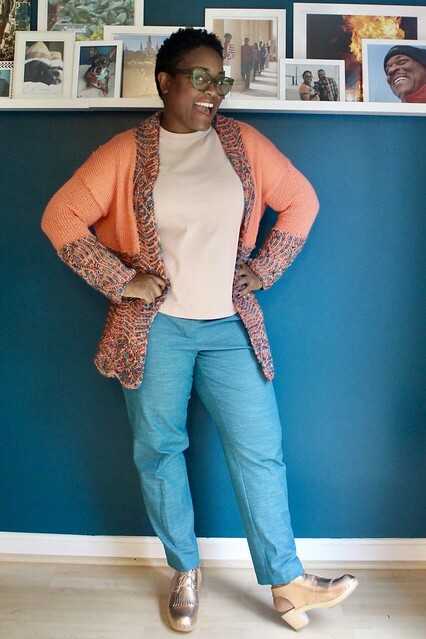 Dana – this looks fabulous on you – you are great with color combos. This would be too warm for me (live in SoCal), but I certainly appreciate it. This color looks great on you, and the sweater, too. I have an orange living room and just love orange. Maybe I need a conch sweater. Or a conch cowl and hat to cheer up my olive green winter coat. So the Mighty Stitch is durable and not too hot? Good to know. I love that design. 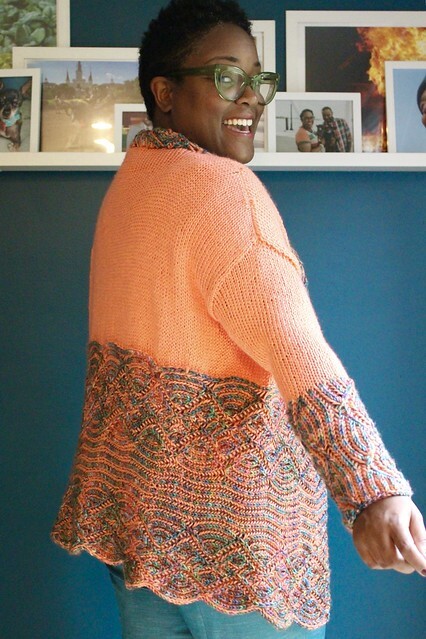 I almost never knit sweaters because stockinette bores me to tears but this one looks like a fun knit! oh my girl!!! you have totally outdone yourself with this one!! beautiful colors and looks great on you.. this is an emmy or Oscar knit for sure. Holy Cow! Your sense of color is AWESOME!! You put together the EXACT colors I would put together for me if I had a freaking clue how to put colors together. I’ve been scared of brioche ever since I learned it a few years ago. I have a little pink shawlette in time out that I really would like to finish. This sweater looks way above my pay grade, but it is just so lovely! I think I’m going to at least buy the pattern since she has a sale on it through 10/20 and I can start dreaming. Use the shawl as more practice to get comfortable with brioche and then make the sweater. I made mistakes too and it turned out just fine! Don’t be scared, what’s the worst that could happen? Those three Tecumseh are ridiculous!! So cute. My eye was immediately drawn to that coral–gorgeous. And I love madeleine tosh for that color!